The best way to travel (well, to live, really) is to do so with all senses. While the virtues of sights and tastes are obvious, I have been really appreciating – and encouraging the kids to appreciate – the sounds. I have taken to recording many a “voice memo” on my iPhone to try to capture different sounds that I know I will miss in the future. Fribourg has an incredible number of churches, monasteries and abbeys, and thus their church bells sound every 15 minutes and are amusingly uncoordinated across the city, so it really seems like they ring all day and all night. Our apartment is just far away enough to render this pleasant rather than cacophonic. 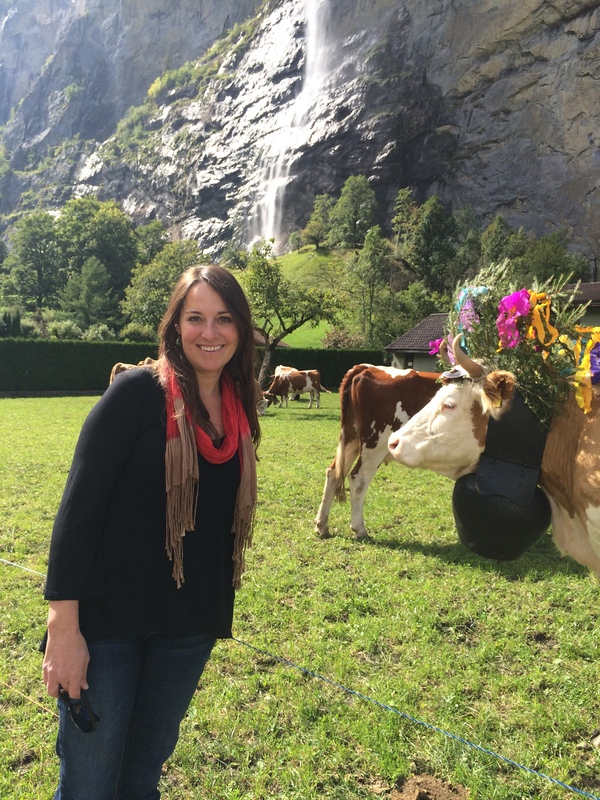 If church bells aren’t enough, one need not strain hard to hear the clinking, dinging, and clanging of the bells adorning cows, sheep and goats that graze in and around town (and fulfilling a cliché, all around Switzerland). These tintinnabula provide a lovely and sometimes dream-like soundtrack to life here; in other words, I love hearing them and have developed a corresponding fondness for the cows here. As a suburban/urbanite, I am delighted by grazing animals. 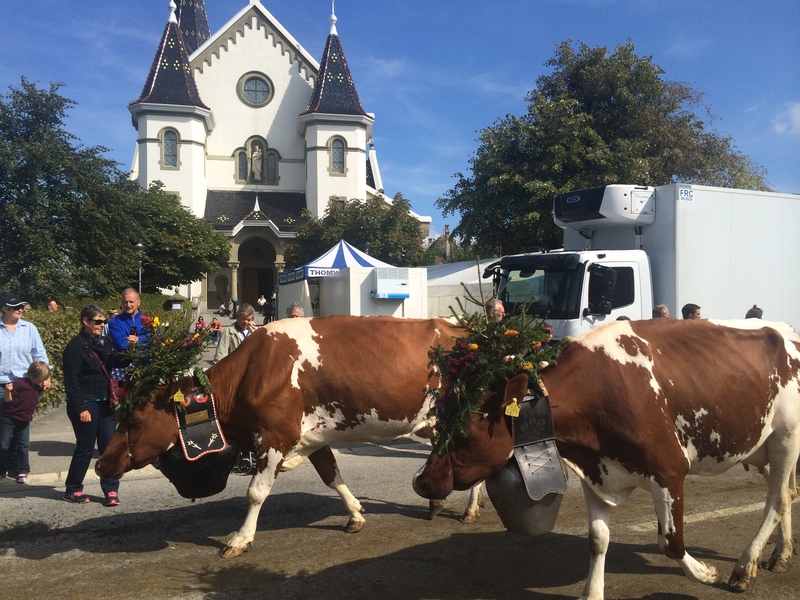 Dairy cows are the local favorite, no doubt, as they are at the heart of human Swiss-ness: the devotion to and high consumption of cheese and chocolate. I myself cannot pass by any cows without calling out to them and holding my hand out for a rough-tongued lick and offering a scratch between the horns (so dedicated was I that I ignored a spousal warning that the fence was electrified and got a bit of a shock! Whoops). I am a sucker for their sweet, gentle eyes and their quiet munching and nuzzling. 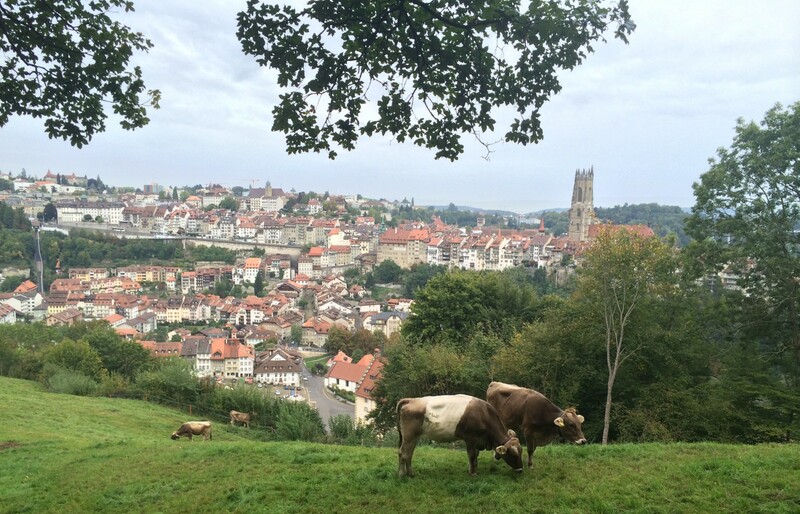 Which is why witnessing the Désalpe – the annual celebrating of the cows coming down from their summer grazing in the mountains – ranks among my favorite experiences ever. This tradition apparently dates at least back to the Middle Ages. 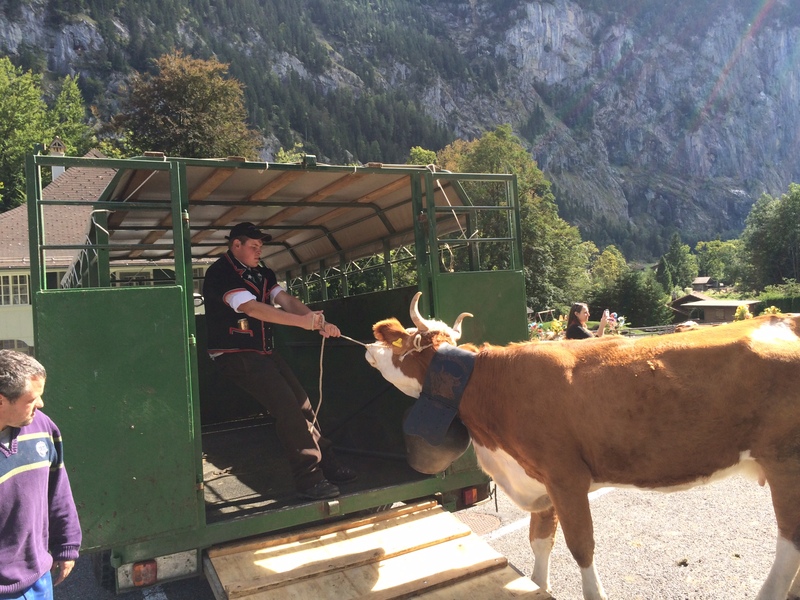 Seasonal migration of livestock (“transhumance”) occurs all over the world and certainly makes great sense in the Alps. In late spring, the melting snow gives way to lush grass and wildflowers, which cows happen to love and also happen to lead to the production of particularly delicious-to-humans dairy products. At that time, farming families join forces to drive their dairy cows up the mountains, a process called the Poya (from the Francoprovençal language Arpitan), generally not to much fanfare. By contrast, the Désalpe (or Rindyà in Arpitan… or in German Almabtrieb or Alpabzug, depending on the region) is quite celebratory and festive. 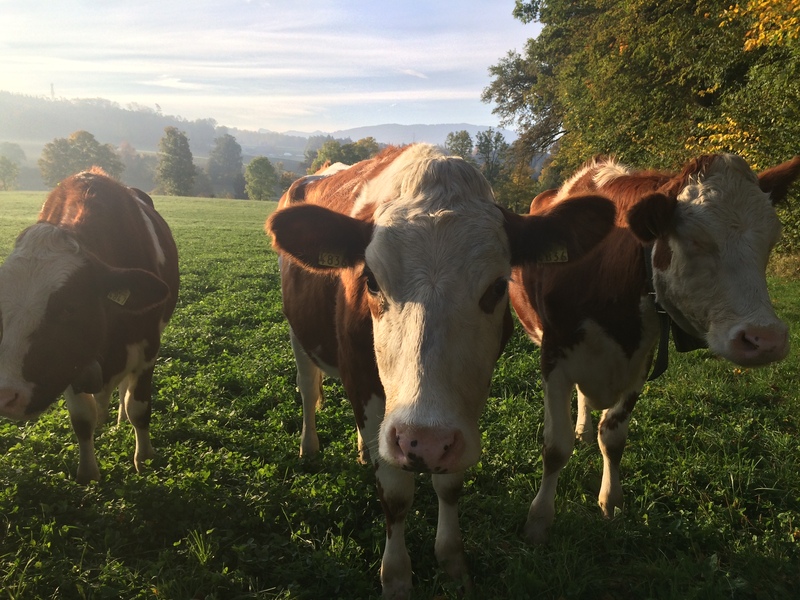 The timing varies around the Alps – traditionally, the farmers take into account the weather and how depleted the grazing opportunities are and (apparently) come to an agreement about when to bring down their cows. 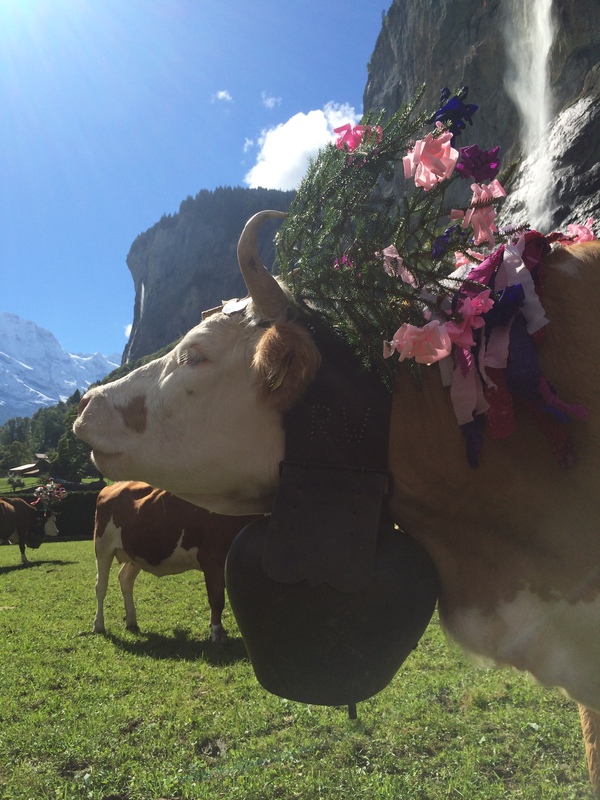 They festoon the cows with gorgeous floral headdresses and giant cowbells for the long walk down back into the valleys. We were told that some walk for six hours before reaching their destinations. 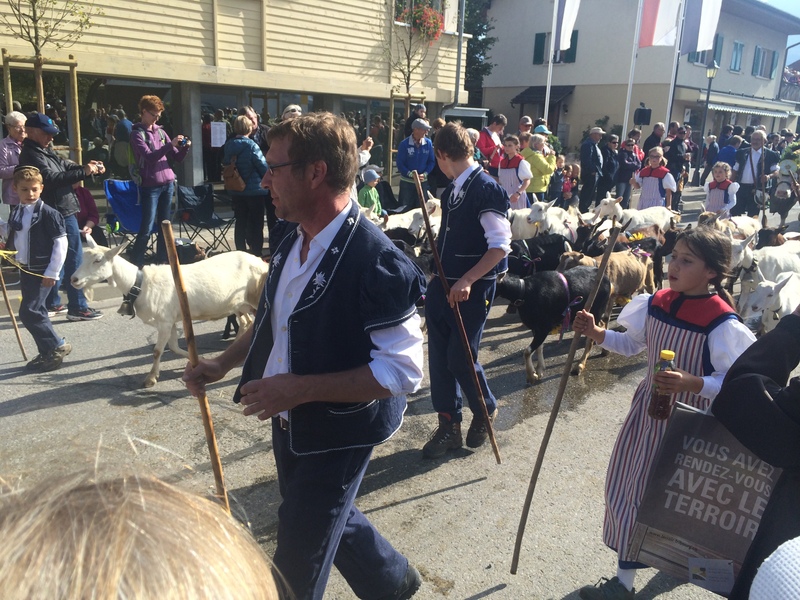 The farmers and their families put on their traditional alpine dress for the journey and end by leading their herds into an area where they are then separated back into family groups and guided back to their “home” farms. Depending on the local tradition, the cows sporting the most impressive floral arrangements and biggest cow bells may be “La Reine” (queen) of her group, decided by cow-on-cow butting and shoving at the beginning of the summer, or they may be the one(s) who have provided the best & most milk, or the farmers’ favorites…. or it just may be luck of the draw. Of course, nowadays there are many towns that “play it up” for tourists and accompany the descent by music, markets, dancing and food – nothing wrong with that, in my opinion. As my mother was going to be visiting us with two friends around this time, we had already planned to attend one of the bigger désalpe celebrations in the region in Plaffeien; in fact, Fribourg Canton had selected it as the “official” one of the season, and it was slated for Saturday, September 26. As Mom & friends arrived on the prior Wednesday afternoon, on Thursday, we decided to go to one of the most beautiful places I’ve ever seen: Lauterbrunnen Valley with its gorgeous waterfalls and then take the cable car up to Gimmelwald & Mürren for the views of the Jungfrau and surrounding mountains. 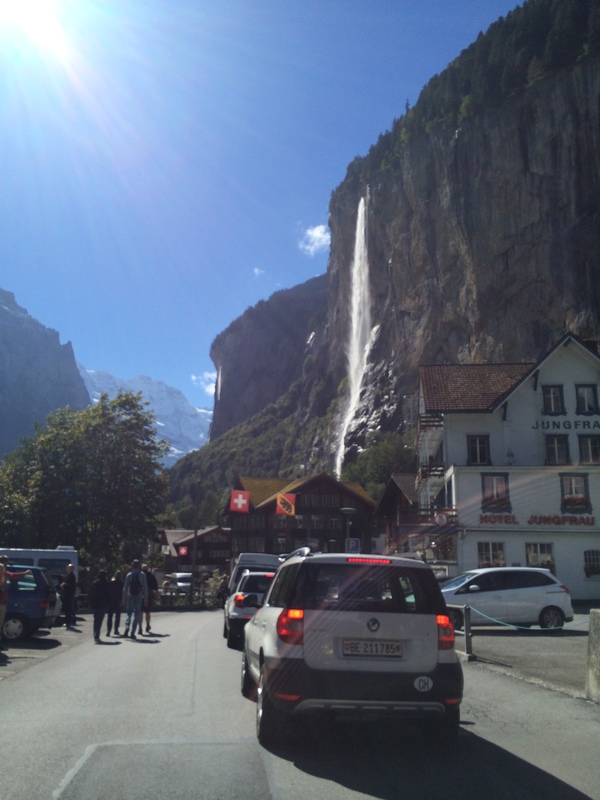 Oddly, as we approached the small town of Lauterbrunnen, we hit standstill traffic. I might expect this in the summer – Lauterbrunnen is quite the hotspot for backpackers and well-heeled tourists alike (for good reason), but on a Thursday in September? Weird. Then I saw the reason for the slowdown: a big herd of cows way up ahead, and I thought, “how cute!” After another minute, I looked more closely and gasped, hardly daring to hope… was that… FLOWERS on the cows’ heads??? OMG. I was so excited to just happen upon this scene at random, I promptly ushered (practically shoved) my octogenarian mom and her friends out to take pictures and catch up with the cows while I sat in traffic. Fortunately, yet another helpful Swiss person told them to get back in the car and for us to park just a bit farther at the church, where the cows were heading. Sure enough, we parked NO PROBLEM, and along with shockingly few spectators, got close up and personal with these florally-festooned bovine lovelies. I was in heaven – the vision of these gals in front of the gorgeous backdrop, wow – but I couldn’t understand why there were so few of us gaping tourists. Then I spied the farmers, off to the side, drinking beer and and enjoying each other’s company. After about an hour, they started peeling off, family by family, to get take their own cows back to their lowland fields and farms. It dawned on me that there were so few tourists, because this was for them – it hadn’t been announced or publicized in any way. These men, women and children were celebrating amongst themselves another successful summer grazing season. We were just extremely lucky to have been able to witness it. 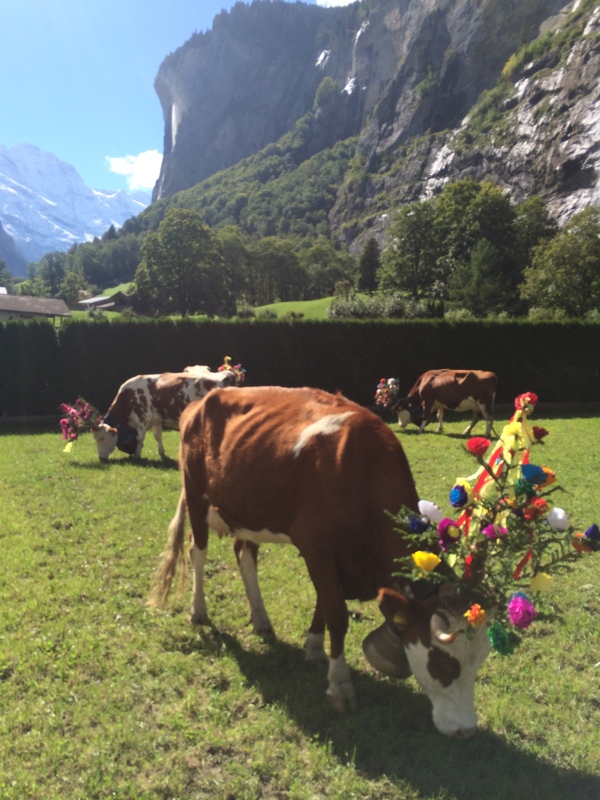 Honestly, I couldn’t have imagined any way to make the Lauterbrunnen scene any more beautiful than it was already. Mirror, mirror… ok, I can’t compete! The Saturday festivities at the official cantonal désalpe was a lot of fun as well but totally different. 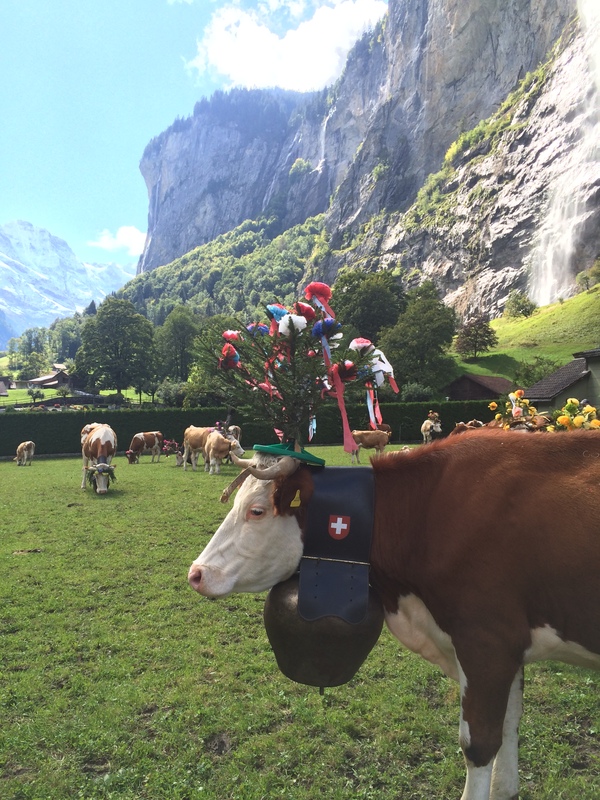 It involved hundreds of cows descending group by group every so often down the road, which was lined with tourists – though they were mostly Swiss and many of whom were wearing their patriotic edelweiss-patterned shirts. 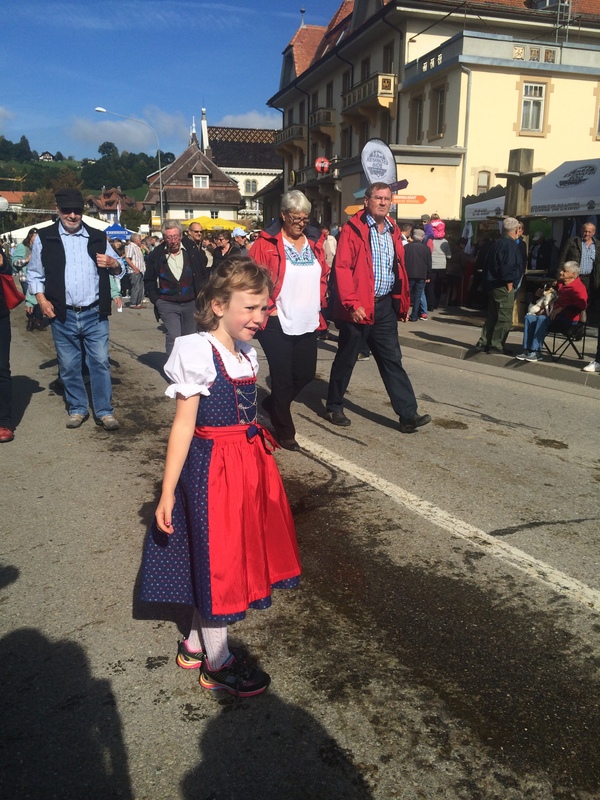 Lots of music and dancing – accordions, alphorns, singing – along with flag waving and throwing and beer drinking. There was a great market as well, and the Canton threw a chance to eat the traditional fall harvest meal of the region, called La Bénichon (unfortunately, the meal was overpriced and disappointing… we would have done better to eat it at a village restaurant. Oh well, can’t win ’em all). We all enjoyed this event, and it was fun to see the désalpe on a grander scale (especially for PapaHatch and the boys, who hadn’t been with us in Lauterbrunnen). 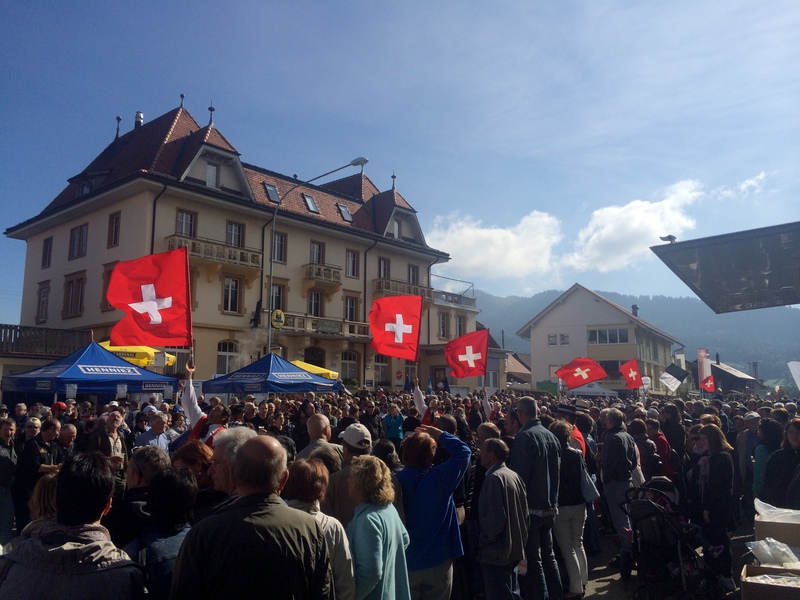 The vibe was happy, proud-to-be-Swiss, colorful and – between the German, the French, the announcer and the parade of giant cowbells – loud. Many of the spectators knew the farmers personally and cheered them on with pride. I really enjoyed seeing how many young families seemed to be fully engaged with traditional dairy farming. I fully enjoyed the désalpe and am sorry there doesn’t seem to be a real equivalent celebration for the springtime Poya, but I will certainly always treasure the memory of the lovely ladies crowned with flowers. In the meantime, I will continue to try to get them to let me scratch their heads, even at the risk of minor electrocution. * Apologies to those who don’t get this reference. Non-Americans-of-a-certain-generation, click here. Hey! Great blog! I have to give an assist to Don Brown for sending me the link. Glad to see you all are having a wonderful experience. I was especially taken with your post about cow bells and the cows’ annual return return from the Alps. Several years ago, I was in a business attraction meeting with Governor Granholm with a Swiss company. They told us the story of the cows returning and the rejoicing of villagers at the sound of the bells. They gave all of us from the state a traditional bell from their village as a token. It’s one of the coolest things any company has ever done for us. Best wishes for a wonderful year! Thank you so much for the nice comments, and I love hearing that the Swiss company told you about this cool tradition. I had never heard of it and was so thrilled by it.